Duration: 20 minute author talk & 40 min Q&A session. Chris Riddell is an award-winning illustrator of Children's books in the UK. 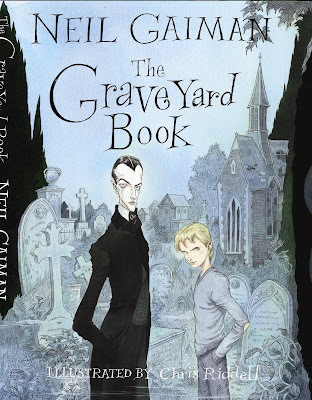 Bloomsbury are very aware that there are two very different audiences for The Graveyard Book -- that it's a book that works as a children's book and it's also a book for adults. So Sarah, my editor, proposed that Chris illustrate the childrens' edition, and that the one illustrated by Dave McKean will be aimed at an adult readership. In the UK, Dave's babe-on-a-knife-edge cover will be for adults (and may also have a signed, limited edition). Chris's version will be for younger readers. I stopped daydreaming about being a famous rock and roll star about thirty years ago, when I stopped being in a band. And it's not a daydream that's ever come back. But I spent the night with friends in Cornwall and got to stay at http://martianengineering.com/residential.html (in the bedroom on the top right of the photos, oddly enough), which is the part of the studio that visiting bands stay when they record music, and I found myself wishing that I was a band so that I could come and stay here for three or four weeks and use all the cool buttons and switches and jaccuzzis and everything. I suppose I could always come and stay anyway, but it wouldn't be the same. Definitely. I'm really looking forward to reading it out loud. In a studio. (Daydreams for a moment about a world in which audio books sell in the hundreds of thousands and I get to come to Martian Engineering for three days with a director... Nope. It'll be at K.N.O.W. in Minneapolis, or in Harper Collins's studio in New York.) It will be out in the US and the UK to coincide with publication (30 Sept in the US, around Hallowe'en in the UK). I am a huge fan of audiobooks (due to some vision problems) and I think you're the single best narrator I've heard -- and the only author reading his own work with a real talent for it. I want to thank you, first of all, for the accessibility of your work to those of us who listen instead of read. But I also really want to know how you learned to read so well. Is it something you're just good at, or did you learn to do it? As I once said here, I think I owe most of it to Miss Webster, my elocution teacher when I was a boy, who cured my nine-year-old lisp within a few months and then over the next six years took me to LAMDA Gold Medal in "speaking of verse and prose"; and the rest to reading to my kids every night when they were growing up. My English teacher says that all good sci-fi exists to comment on society and its problems. As an author and a reader of science fiction, do you agree with this? Not unless you change the words "all good" to "some". It's one of the many things that SF can do, and it's one of the many things that good SF can do. But there are lots of other things it does, including simply tell good stories (a valid end in itself). Where (if possible) could I find your podcasted interview about the Ramayana? Just curious. as soon as the Brtish Library puts it up (to coincide with their Ramayana exhibition, I expect) I'll link to it here. Hi. I'm eighteen years old and entering college. I've wanted to be a writer as long as I can remember, and I was wondering if you could recommend any specific classes to take in college that could help me grow and develop into a successful author? Hi Neil - congratulations on being included in Weird Tales magazine's list of the 85 weirdest storytellers of all time! ps. You're not nearly as weird as Cirque du Soleil - they scare me. A lot. When I get home, I will tell Maddy. It will make her happy to know her dad is officially weird, rather than just, you know, informally. I went to the British Library today and recorded a podcasted interview about the Ramayana. In case you were worrying. And I had lunch with my editor at Bloomsbury. Oddly enough, Dave and Claire McKean were at the next table (in town to hang an exhibition of art at Foyles). It was lucky that my editor really liked the new The Graveyard Book cover, and so did I, or bread rolls might have been flung. It's worth drawing people's attention to the fact that the free online reading copy of American Gods is now in its last six days online (it ends 31 March 08). I learned this from an email from Harper Collins, which also told me the latest batch of statistics. The book is up at This URL, if you're interested, or want to pass it along to a friend. I was wondering if you'd consider giving a shout out for Don Rosa, the prolific writer/artist behind many great Uncle Scrooge and Donald Duck comics. He is spending the next six months recuperating from surgery for a detached retina, and I thought people might like to keep him in their thoughts and prayers. Of course. We used to sit together a lot at foreign conventions, Don and I. People would look at us puzzled, and obviously wonder why the Uncle Scrooge guy was talking to the Sandman guy and what we could possibly have to talk about. Mostly I would be learning all about hummingbird feeders and bluebirds, and how to look after woodlands and suchlike, and sometimes I would be explaining to Don how comics business was conducted outside of Disney, and he would take that information and use it to better his lot across Europe. He's a really good guy, and I hope he recovers quickly. This isn't a question, but rather, an apology for something I've felt badly about for quite a while now. I attended your reading and signing, in Toronto, for Anansi Boys. It was a fabulous evening, and I was lucky enough to be one of the first people in line to have my book signed. You drew me a very nice Mr. Punch, unasked, much to my delight. Thank you for that. The reason I need to apologize is because, of the many photos I took that evening, one fills me with such terrible guilt I can't even look at it. The reason? 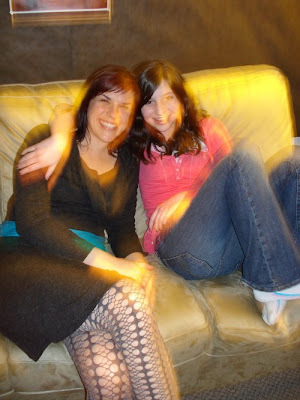 My camera's auto flash setting. Which turned back on every time my camera went into standby, and which I'd not thought about until I perpetrated the following upon you . . . There's one photo I snapped of you during your reading where you have extremely intense red-eye happening, and I can only imagine the blinding that must have caused. I am so, so sorry. I fully intended to respect the no-flash policy, and should have remembered to switch off the default setting. Every time I walk by that church, I feel terrible guilt. Moreso than I normally feel when walking past any church. It's a small thing, and it's ridiculously late in coming, but I thought I'd at least get it said. Now my church-related guilt levels can return to their normal, questionably healthy levels. Not to worry. I have world class photographic red-eye pretty much all the time. As a general rule, if it's taken with a flash, I look like I am possessed by the blazing forces of darkness, at least in the eye department. It's sold a lot of copies, but Odd and the Frost Giants hasn't got many reviews -- http://www.greenmanreview.com/book/book_gaiman_oddandthefrostgiants.html is one of the few. The convention's over, and it was really good. Lots of wonderful people, a really nice atmosphere, and my main regret was all the conversations I never had -- I made China Mieville promise that we'd do a panel one day of us chatting, because we never manage to finish conversations and he knows so many cool things (and he seems to think that I do). And there was the party in honour of the upcoming Anticipation -- the 2009 WorldCon in Montreal . (http://www.anticipationsf.ca/English/Home) I talked to the con chairman, and then to Farah (who is head of programming) and we're starting to come up with some ideas for things that would be really special and fun. Also I seem to be guardian of an enormous pink pig. 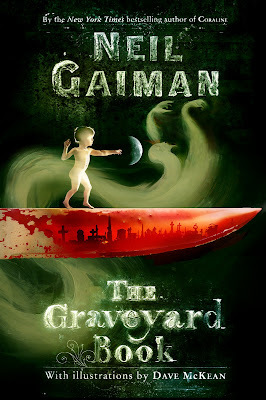 Dave McKean sent over the cover to the Subterranean Press edition (and probably the Bloomsbury Adult edition) of The Graveyard Book. And this is the wraparound cover, with the front and back cover and the space for the dustflaps, but without the text. My daughter Holly is here. She has been persuaded to take her coat off. She says she needs to be mentioned more in this blog. She says that I ruin the whole effect, however, if I actually point out that she just said that I should devote the spotlight to her here. She says she didn't actually say that and that my innocent paraphrase is in fact all hellish lies. Holly would like to say something. Maddy Gaiman has the best sister ever. 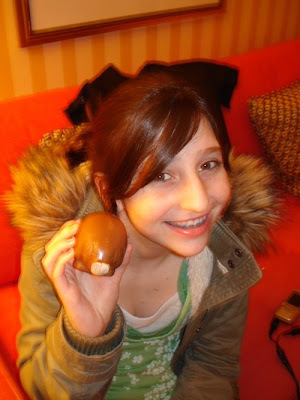 Happy Easter, Maddy. So far today I've been interviewed by the French, done a Kaffeklatch (where 8 people who had their names drawn from a hat had coffee with me, although I drank tea) a Guest of Honour Reading and Talk, and another interview. Still to come today, a Wolves in the Walls reading for kids (and adults who have kidnapped kids and are using them as props to get in with) and another autographing. And an interview with Romanians. I was interested in your throwaway remark on navigating the London Hotel. "It's a terrific convention (in a hotel the geography of which I cannot quite grasp)"
My wife and I spent our Silver Wedding anniversary in Vienna, and despite my reading up beforehand, I felt ill at ease using the underground trains as I couldn't get my bearings and felt terribly edgy for the first day and a half. Once we walked around the inner ring of Vienna I had my bearings and was able to feel psychologically much better. Weird huh? Have you read "The Art of Travel" by Alain de Botton? His practical philosophy is so interesting and makes me realise I'm not alone in feeling edgy on arrival at a new place - not for fear of attack - but insecure in the geography. Truth to tell, I quite like new places, and don't really mind unfamiliar geographies. This hotel, on the other hand is something else. I am used to sensible, Euclidean spaces, in which if you go through enough 90 degree angles you wind up where you started. Try that here and see where it gets you. It reminds me enough of the description of the unlikely convention hotel in Diana Wynne Jones's DEEP SECRET that I have to ask her if it was based on this hotel. Me: You're forgetting the time difference. Really, I just need to sleep. So I got up and ordered an omelette from Room Service. http://www.denvention.org/hugos/08hugonomlist.php is the Hugo Award nominations. It looks a really good list. I was pleased to see them all on the short list. And Stardust is on the long list (up against Harry Potter, The Golden Compass, Enchanted, and the whole of season one of Heroes), so congrats again to Matthew and Jane. Labels: Hugo Awards, omelettes, You know I wonder if anyone actually reads these things? On the subject of all things Terry Pratchett, there is a North American Discworld convention in "Phoenix, Arizona over Labor Day Weekend, 2009 (Sept 4-7, and maybe September 3 as well)" -- details at http://www.nadwcon.org/. A first review of The Dangerous Alphabet, the odd alphabet book by Gris Grimly and me, at http://editoon.com/sandbox/?p=849. Susanna Clarke's short story Mrs Mabb can be listened to for the next 6 days via http://www.bbc.co.uk/radio4/arts/afternoon_play.shtml click on Tuesday. Apologies to everyone who wrote from the Portland area asking if I would be doing a signing and if not would I sign just for you. Nope. Maybe next time (as it was I spent a couple of hours signing for all the hundreds of modelmakers, animators, costumers, carpenters and other wonder-workers at Laika. Mostly people's books and Coraline posters, but a few odd things including a naked Miss Forcible). Maddy and I ran into Powells when we got back from Laika today. Laika had given Maddy a Powells gift card, and I love that place. Next to Arthur C Clarke's books was a note saying that he had died today. I met Sir Arthur C Clarke in 1985, when he was in the UK to promote the film of 2010. He was staying in Brown's Hotel in London, where the doormen wore top hats and the hotel interior didn't seem to have changed in a hundred years. I interviewed him for Space Voyager magazine, but all I remember is that he was very kind and polite, and a vague surprise in discovering that he had a West Country burr in his voice. He seemed like someone from a past era, in that elderly wood-and-leather hotel, frail and elderly 22 years ago, but he was someone who had showed me the future, and who was living, very happily, in the future. I grew up reading Clarke -- books like A Fall of Moondust and The Deep Range were books I'd read and loved before I turned ten -- but the story that made the deepest impression on me was a short story, 'The Nine Billion Names of God'. There's a wonderful interview with Terry Pratchett in the Guardian. I would have loved to have been in the room with Terry when he read the final line, though -- "Good Luck to you, you sweet man." I remember the noise Terry made when I told him that a gentleman who had been his minder at a convention had described Terry to me as "a jolly old elf". I don't think that teeth actually ground together but it was a jolly good noise all the same, and he said several things that were not at all elf-like. It was the Best World Book Day Ever. 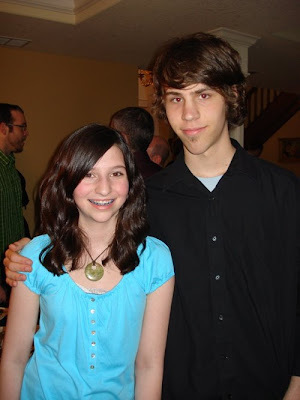 I know you said you weren't doing the last.fm friend thing, but is there any way you could? Reason I ask is because it's the only way I can see your playlist and be able to listen to your music through my living room entertainment center (the media center software I'm using will only allow me to choose 'Friends' and then streams their radio station; i can't surf by username alone). is the ID -- http://www.last.fm/music/Neil+Gaiman is where you can find stuff by me to stream or download. 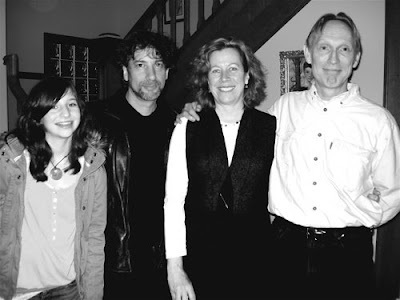 Myself, Dad, Heather and Henry Selick. Yeah, we look cool. I know. The Wonderful Madeleine and Henry Selick's son, Harry. 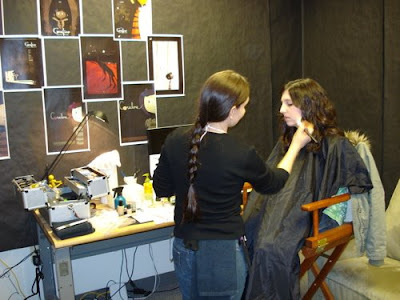 Me getting my make-up done! Oooh la la! Marvelous Maddy and Shining Shelley! Dad, me and Merrilee in a yummy little sushi restaurant! P.S. If your daughter has never tried a Caterpillar Roll, please do not persuade her to pop one in her mouth. The whole eel and avacado thing is not something that a particular 13-year-old is a fan of. That's all for now folks. 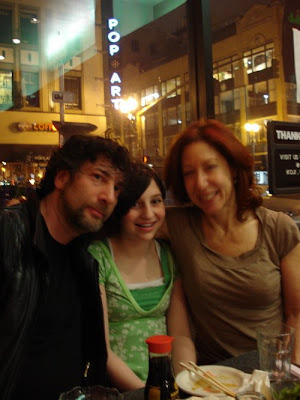 Oh and by the way as I am writing this, my father, aka the brilliant yet slightly odd Neil Gaiman, is downstairs signing some books like crazy! GOOOOO DAD! Lou Reed at The Levi's®/FADER Fort from The FADER on Vimeo. From The Beat, here's P Craig Russell drawing the Sandman Dream Hunters comic. Sometimes I lose track of time -- Maddy and I are going to go to Laika in Portland for a couple of days, to visit the Coraline set. Truthfully, it's Maddy who will be doing most of the work -- they want her to interview me and Henry Selick and several of the crew. I thought I had many hours before I left. Days maybe. And suddenly I'm gazing bleary-eyed at the day as Lorraine tells me there's a car in the drive and Maddy and I leave in fifteen minutes and probably I ought to put on some socks. Thanks for blogging the initiative to match Terry Pratchett's $1 million donation to the Alzheimer's Research Fund. In way of an update to that, there is now a website - http://www.matchitforpratchett.org/ and a Facebook group (naturally) - Matching Funds with Terry Pratchett. It might be helpful to mention these as well on your blog, if you were so inclined. Looking forward to seeing you at Orbital. Also, I think I have slipped into a parallel universe in which everything is reversed. The Sun accurately reports everything that Terry said, while the Daily Telegraph sexes it up and tries to make it controversial. Jonathan Carroll sent me a wonderful poem by Li-Young Lee. My friend Penn Jillette continues to do things that scare him. And one of them is Dancing on Television. Something that would scare me. It's Dancing With The Stars, the US version of Strictly Come Dancing. March 17th on ABC. Kym Johnson (from Australia) is his partner. He's working so hard and is doing his very best to win! CafePress store and buy some shirts! text 10x from each phone line you have. So there. Meanwhile, Colleen has rediscovered her Barbie Whistle Torch. So Kurt Busiek wrote about Odd and the Frost Giants, and I linked to it here and he emailed me, and I needed to ask him if I could use a bit of something he and I plotted on a long car journey about 12 years ago for a mystery project, and he said yes, and I sent him The Graveyard Book as a thank you. 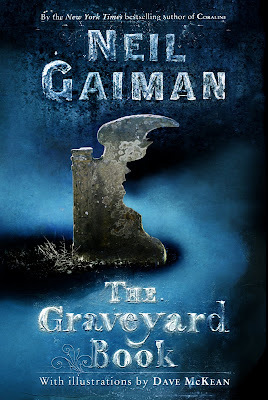 THE GRAVEYARD BOOK's title is an homage to THE JUNGLE BOOK, since TGB is about a boy whose family dies, and who winds up being raised in a graveyard, by ghosts, and the other things that lurk there. The boy, named Nobody ("Bod" for short), learns many things, discovers odd places and curious people, deals hesitantly with the world outside the graveyard and eventually has to deal with the forces that killed the rest of his family, and who are still looking for him. I won't say much more about the plot, because hey, it's not going to be out for months. But I think it's likely Neil's best novel yet. It has a great deal of warmth, whimsy, dark fantasy (verging on horror), adventure, charm, suspense, monsters, ghouls, a witch, school bullies, policemen, ancient burial mounds, knife-wielding killers, dancing, mystery, trouble, a dash of romance, life lessons, and a creature named Silas, who is both what he seems to be and not. And the most endearingly dangerous and threatening ancient terror you've ever met. The story's engaging, there's a real sense of menace, and it builds to a strong and satisfying climax. The ghosts are a delight, and the sense of magic and possibility and things happening in the shadows is compelling and attractive. The writing is quite good, but not showy -- the story and characters take first place, always. It's a short novel, under 70,000 words, and it works as YA, provided you don't mind YA books starting with dead bodies (including a child), bloody knives and a toddler in jeopardy, but it's not limited to that -- it's a book that'll be as satisfying for an adult to read as for a young teen, but they'll get different things out of it. It's more in company with STARDUST and NEVERWHERE, in that it's an occasionally-dark fantasy involving a world one step outside our own, than with AMERICAN GODS and ANANSI BOYS (which are more about stuff intruding from the beyonds into our own), but written by someone who's had that much more practice than any of those. I could say it's "like GOOD OMENS meets A FINE AND PRIVATE PLACE" but, well, that's a facile and shallow comparison, so I won't. In any case, this is a wholehearted recommendation. I like most of what Neil writes, but THE GRAVEYARD BOOK is very high up on the list, even so. Today my assistant Lorraine is in the kitchen doing mysterious things to obtain beeswax from slumgum, and I am mostly on the phone copy-editing The Graveyard Book. Anyway. Free books. I started thinking about times we've used this principle in paper books -- using the free thing to spread the author or the idea, and, if you ignore the five fingered discount (remember, in the UK you can add Terry Pratchett to the "four authors who are flying off the shelves and don't forget the graphic novels" list) then you still have things like Free Comic Book Day. And before there was ever Free Comic Book Day, there was Sandman 8. Rachel McAdams says she would like to be Black Orchid on the screen -- I'd like to see that too. I didn't know what I was doing when I wrote Black Orchid, and it shows, but there's some dialogue I'm still really happy with, and a wilful attempt to avoid cliche that I'm still proud of. And Dave McKean created an entire school of realistic superhero art (one he's still apologising for). It was our first full-colour baby. How does he come up with the cover images? Dave I mean. Does he just make it up out of his head like writing? Or is there a HarperCollins committee that says, "We would like a blue cover with a knife. And perhaps a black one with some mist...no no, more swirly please." Can you ask him? And if he answers, can you post it? I can answer this -- I was there and watching it. The first cover Dave did was done to a Harpers request (they sent him a sketch of the kind of thing they wanted, and he painted that). With the more recent ones I posted, Dave had simply read the book (which I was still writing when he did the first one) and then sketched a bunch of potential covers and handed them in. Well, it exists, and it might be used in promotion, or turn up in the back of the Subterranean Press Edition or as a colour Frontispiece to the Bloomsbury limited edition, but it probably won't be a book cover (unless there's a foreign publisher who wants it, I suppose). It was done to order, but it really didn't reflect the book I wrote, which was why we went back to Dave and said, "you don't have to worry any longer about doing a book cover that looks like it's for young readers. Just do a book cover." And yes, I think most of the ones he came back with are stronger than that was.